With reports indicating that the RLD has failed to consolidate Jat vote-bank in favour of the alliance with the Congress in the sixth phase, for which polling was held on Tuesday, the party leadership is apparently worried about the poll outcome. The RLD and BSP camps indicated that the Jat vote-base has split in big ways in western Uttar Pradesh. 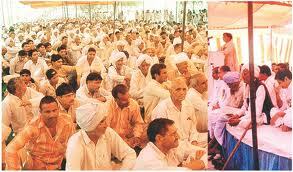 “We are hearing reports that Jats have voted for different parties. However, we are hopeful that the RLD will hold on to its current strength even if there is no remarkable increase in our tally,” said an RLD functionary. The ground reports trickling into party camps indicate that the Jats have voted for their community candidates fielded by different parties, while the constituencies where there were no strong Jat candidates they voted for the BSP, BJP and even the Samajwadi Party.